Mustered into Captain Geo. W. Fulton's Company E of the 21st Missouri Infantry Regiment at Canton, State of Missouri, the first day of February 1862 at the age of 23. 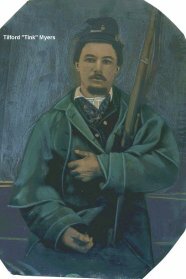 Tink served in the Union Army during the Civil War and was in many battles. He received a disability discharge after the battle of Shiloh. After regaining his health, he joined the Regular Army and was sent to Colorado as an Indian Scout. He was killed in an Indian battle near Georgetown, Colorado in 1864. Biographical information was generously provided by Denise Armstrong .